Green Fingers, Triffids And The Joys Of Gardening - Not! see how it should be done. The god of gardens both great and small sure passed me by when dishing out green fingers. 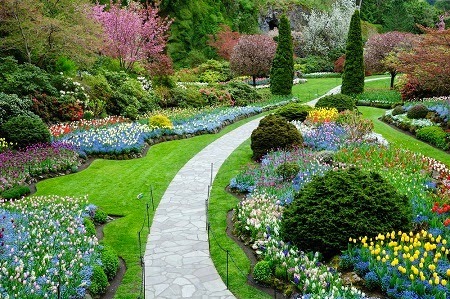 I mean, I want to have a great-looking garden. Honestly I do! But, sadly, gardening nirvana is something I'm not likely to experience this side of the ether no matter how many gardening mantras I dutifully chant. But it's spring, again, which means grass grows and hedges take off into the wide blue yonder and weeds turn into triffid-like monstrosities, no doubt out to take over the world, beginning with my little garden. So you've all been warned! Triffids? So what are they exactly? According to good old Wikipedia, triffids are a fictitious, tall, mobile, prolific and highly venomous plant species, the titular antagonist in John Wyndham's 1951 novel The Day of the Triffids and Simon Clark's 2001 sequel The Night of the Triffids. Fictitious? Funny, but that just about describes the plants...I mean weeds in my garden to a tee! And talking of weeds means it's about time for the annual ritual, which goes something like this. Armed with a vicious-looking hoe, I head over to the patch of ground peppered with green somethings and the remnants of last year's perennial wot's-its, closely followed by my eagle-eyed partner. "Stop!" she shouts. "That's not a weed!" "Is this a weed?" I say. I try again. "So what's this then?" "And this?" I say. "Another weed?" "No, that's a plant. This is a weed. Do you get it now?" I don't really but the ritual carries on until all potential weeds in the garden have been identified and marked down for destruction. Ah, the joys of gardening! Wouldn't miss it for the world.